Last weekend, I was pleased to be a guest along with other Maine food bloggers who were invited to try the new brunch menu at Tiqa. Having previously reviewed a dinner at Tiqa, I didn’t expect that the brunch would be sub-par, but I was still very curious what the meal would bring and excited to see the new menu. Other than offering their signature pan-Mediterranean flair, I didn’t really know what to expect. When my wife and I arrived, we were seated at the bar. We were given the indication that we would be greeted by the chef and then provided a sampling of various foods. We sat for a bit waiting for others to arrive while watching a football pre-game show and chatting about the week to come. The bartender provided waters and coffee and after a little time had passed, we amassed a small crew of word-happy foodies ready with empty stomachs and a case of the hungry Sunday mornings. The chef came out from his food prep palace and our crew got brunch food and drink menus. He let us know that he would be back shortly so that we could ask any questions we might have. After looking at both menus, I was pretty comfortable with what I saw. When the chef returned, there didn’t seem to be any significant questions. The bar manager and bartender offered us drinks and I took a more thorough look at the drink list. The menu had two types of mimosas, two types of bloody Mary’s, and a sangria. I went with the Harissa Bloody Mary and my wife ordered the Tiffahah Sangria. Our drinks came out in a few minutes. I don’t generally like Bloody Mary’s but I do like harissa so I figured I’d give it a shot. The drink was made with Absolute Vodka, harissa puree, bloody Mary mix, and a skewer of cocktail onion, olive, cherry tomato, pepperoni, sweet pepper. It was also adorned on either side by a slice of lemon and lime. I’m a huge fan of the loaded skewer garnish, so the drink was off to a good start. I feel like more on the skewer means more flavors to accompany my drink and being a flavorphile, I see that as a strong positive. I tried a sip and it was outstanding. It was quite spicy from the harissa and I really liked that. 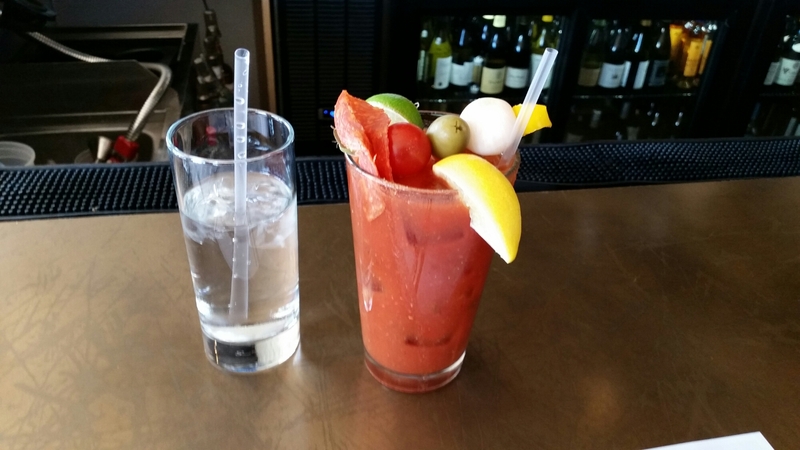 I haven’t had many bloody Mary’s I liked, but that one was the best I ever had. If you like spicy bloodys, you’ll love it. My wife’s sangria with sauvignon blanc, apple brandy, pear puree, muddled apple, and nutmeg and she loved it. I sipped away on my delicious drink and waited to see what was in store to chew on besides my garnish. I saw others ordering and in a change from what was originally alluded to, we were asked to order from the menu. 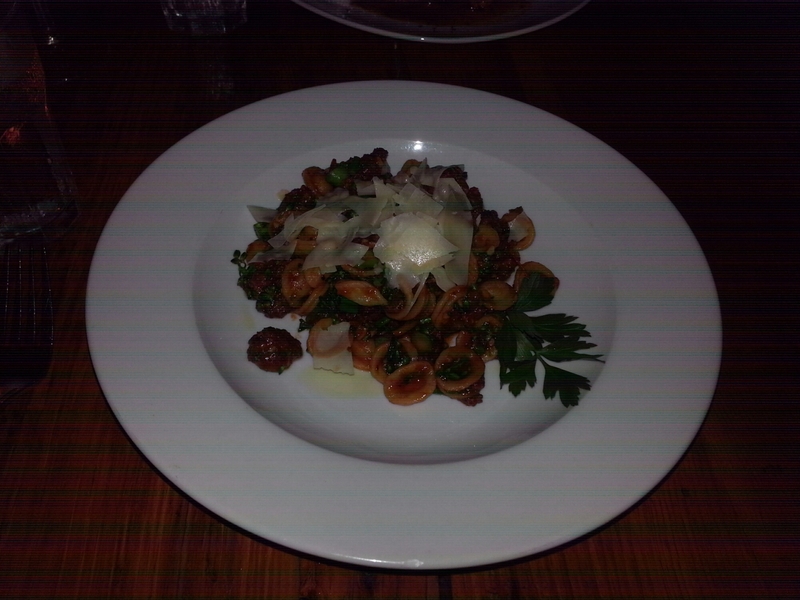 I quickly picked Pastirma Beef Hash – Turkish slow-cooked brisket, roasted tomato, two eggs any style. My wife kept it simple with Two Eggs, any style with spiced potatoes and roasted tomato. While we all waited for our food, we made use of phones and cameras in addition chatting here and there. I walked through the Patriots game in my head and thought about how my consumption of brunch would affect my ability to stay awake during the game. As food started to come out, I saw pastries, Lebanese-inspired pancakes, and potato latkes, among others. I was drooling in anticipation of my meal. When I finally received it, my hash was completely hidden by my eggs-over-hard hat. I removed the eggs from the hash. I also noticed that I had a green salad instead of the tomato on the menu. It weren’t no thang though as I was fine with salad. I dug in right away. The eggs were standard and cooked correctly to my specifications. The hash was good with bonus points for being cooked very crispy which I believe is how all hash should present itself. I don’t like it soggy and soft. The salad was excellent too. My wife was pleased with her scrambled eggs. I tried the potatoes which I believe were spiced with the same harissa that was in my drink. My food was excellent, but right in the middle of eating, we were brought a Walnut Spinach Fatayeh. My wife and I shared it. I didn’t love it, but I’m not a fan of cooked spinach. The spinach flavor was mild though, and while I enjoyed the walnut crunch, I had my heart set on a sweet pastry which it was not. Still, I had a few bites, and then, because I couldn’t get the sweet pastry idea out of my head, I ordered a babka. Others had already ordered some and I couldn’t pick between chocolate and salted caramel options offered, so I asked the bar manager to pick and bring one for my wife and I to share. Babka arrived, but it was one of each. I jumped right in to try the salted caramel. It was delectable – easily among the best pastries I’d consumed in recent memory. The babka was soft, gooey, salty, and sweet without being death by caramel. I tried the chocolate one. It seemed to be a dark chocolate and not very sweet. It was delicious too, but I was in the mood for something a little sweeter and the caramel fit the bill. I heard the bar manager mentioning that the pasty chef had extensive pastry experience and education and it showed. The babkas knocked it out of the park. Just when I thought the fun was over, the chef, by way of the bartender, offered the Moroccan Benedict – Tzimmes braised beef, harissa-tomato hollandaise. I accepted with the caveat that they should bring only a small portion. When it came, I got a half-size meal which included the spiced potatoes and roasted tomato too. As a guy who doesn’t eat hollandaise, I was concerned about this one but still game to try. The beef came on top of the bread which was then topped by a poached egg and then the spicy hollandaise. I’m not sure what the bread was exactly, but it seemed like focaccia of some sort. Like all the rest of my food, I dug into the Benedict like it was the last meal of my life. I was shocked at how good it was. The beef was tender, the bread was moist, and the kicker was that damn delicious harissa. I ate like a hungry dog at the Alpo factory. I loved the spicy potatoes too, though I thought the tomato, which was topped by crumbs, needed to be jazzed up a bit. It was just a small side though, so it was hardly an issue. I finished the last bits of my meal and made my way out of the restaurant. Tiqa did a great job, offering delicious plates of palate pleasures. They are on to something with their liberal use of harissa and they certainly have plenty of items for those of sensitive tastes too, but if you like a spicy brunch, Tiqa combines spice and intense flavor really well in at least a few dishes and drinks. I highly recommend the Harissa Bloody Mary and the Moroccan Benedict. If you’re looking for something more on the sweet side, order a Salted Caramel Babka and then order a second one. They are incredible. I was really pleased with Tiqa’s brunch and they definitely have something for everyone. I dare you to try it and tell me I’m wrong. And when you go, tell ’em Peterpeterportlandeater sent ya’. 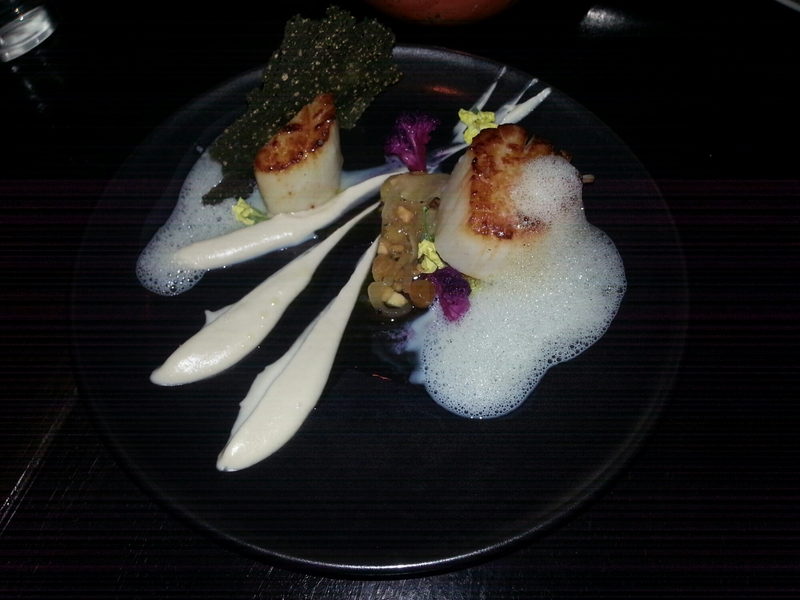 This entry was posted in Portland, ME food on September 30, 2015 by peterpeterportlandeater. When I see the list of new restaurants opening in Portland, I always think to myself “I can’t keep up with the new restaurants, let alone go to the well-established ones I haven’t been to yet.” But never one to turn down a challenge, I added Terlingua to the list of eateries I had to get to and when my wife said, “Let’s go to Terlingua”, I responded with the ubiquitous word of acceptance. “Okay.” In business since June, the restaurant touts that it has both BBQ and Latin American cuisine which I thought was an interesting pairing. After a couple of beers elsewhere, we made our way to the Washington St. restaurant. Arriving at the specified location, we walked past an outdoor chalkboard sign which indicated the lunch hours and noted that BBQ started at five of the clock. It was past five, so my craving for BBQ would hopefully be satisfied. Inside the restaurant, I noticed their bar area which was really nice with lots of wood and also full of patrons. The restaurant looked good overall, but the bar was definitely impressive and functioned as the centerpiece in my estimation. We strategically sat at a table close to the bar and began to look at menus. The waitress pointed out that specials were on chalkboards on either side of the bar. One board specified the drafts and a drink special. The other listed the food specials and the available BBQ meats that day. I looked at the drink menu in an effort to make a decision on a thirst quencher. Nothing stood out to me. Then I focused on the drink special – the Paloma with Espolon Blanco, fresh grapefruit, and citrus sea salt. That didn’t sound good to me as I don’t generally enjoy grapefruit, but in a pattern of behavior that seems to occur more and more lately, I ordered one even though I thought I might not like it. It was a chance I was willing to take. My wife ordered herself a sangria and I the Paloma and then I tried to finalize my food choices. The menu categories were starters, main courses, BBQ, and sides. I had pretty much already decided on BBQ and I wanted the chicken. I didn’t know how it came – breast, leg, whole chicken…it didn’t matter. I also figured I should try something else, so I got a side of the Grilled Corn with bacon, cojita cheese, and cilantro. My significant other went with the Chicken Pazole – hominy, avocado, radish, cabbage, lime – and the Roasted Cauliflower with poblano and cheese. Our drinks came and we put in our food orders and took sips of our libations. I nervously tried my Paloma. “Well, well, well, what an interesting combination,” I thought. The grapefruit and tequila tempered each other so that they were both mellow and smooth like any Christopher Cross song. The drink surprised me. My wife did good work with her sangria which had some lemon and blueberries in it. We sipped away and as we did so, the restaurant started to fill with some of the hungriest people in the area. Participating in a discussion about North Antarctic tribal rituals involving tin can telephones, my wife and I were pleasantly interrupted by the arrival of our food. 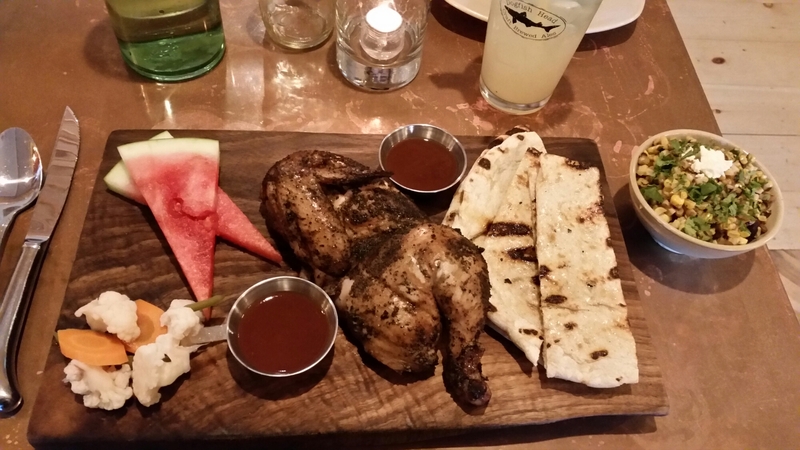 I got a half-chicken with honey-butter bread, escabeche pickles, watermelon, and two brown sauces – one a spicy vinegar type and one of the sweet and smokey variety. The menu suggested I had a choice of sauces, but they both showed up on my plate which was just fine with me. My grilled corn came in a bowl as did my wife’s two items. After a quick assessment, I was ready to try the food. I dug into the chicken. It was smokey and flavorful with the typical pink hue that comes from smoking it. After that initial bite, I pulled a sizable piece with which to try the sauces. I first tried the vinegar based one. It had a potent spice which I loved. I tried the sweeter one and that wasn’t bad, but a little sweeter than what I wanted. My wife, ever the contrarian, preferred the sweet sauce. The grilled corn was sweet and heavy on the cilantro which I liked. The bacon was a little light and seemed to be more of an afterthought. It was still good, but those flavors were nearly undetectable and I challenge Terlingua to add more of the smokey swine. My wife liked her food and I tried the cauliflower. It was great, mimicking macaroni and cheese which to me is always a win. A few bites of chicken and corn were down the hatch and I needed to try my sides. I took a bite of the honey-butter bread and it was delicious – crispy and slightly sweet. I tried it with the BBQ sauces and the sweet sauce complimented it quite well. This was where I needed to use that sauce since I mostly used the other one for the chicken. I enjoyed the pickles which consisted primarily of cauliflower and carrots with a minor showing of green bean and onion. I gave my wife the watermelon as I would never eat that most foul of fruit. Yeah, I’m not a fan of the watermelon. The food was good enough to finish and we were asked if we wanted dessert. We passed as we often do. The meal came to 56 shillings before tip. It was a reasonable price, though I did notify the waitress that the charge for my drink was $1 more than what it was listed for on the special board. She promptly gave us a dollar which I added to the tip. It wasn’t a big deal, but I thought some people might not like that discrepancy and wanted to give them the opportunity to correct it. All in all, Terlingua puts out a solid meal. The smoked chicken was excellent and that spicy sauce was too. My corn could have used some more bacon flavor, but it was still good and that drink was shockingly pleasing. I’m glad that Portland has another BBQ joint, but I’m even more glad that it’s not a straight up BBQ place, but a hybrid with Latin American flavor. Their unique combination is something I think people will go to for good eats and good drinks for some time to come. This entry was posted in Portland, ME food on September 28, 2015 by peterpeterportlandeater.